Hmm, wonder if I can beat last years record of three total posts for the year? My show season has already gotten off to a good start. Back in November I decided to set a goal of getting my filly ready for the big holiday showdown open show in the middle of December. I took advantage of the month of free board my neighbor offered me in return for a favor i had done her, and finally put in a solid stretch of training time. Molly is the last foal we raised, born the same year as my twins. She is six now and until November had never had more than 3 or 4 days of consistent riding. But she's just like her mother, extremely intelligent and relaxed, so she wasn't too big of a challenge. Her biggest fault is also one of best attributes - shes extremely agile, and when she decides to rear and buck, she means it. Thankfully, there was no acrobatics under saddle during training or the show. We really didn't make much progress during the month of riding, but we made huge improvements by the end of the very chaotic three day show. We only did walk-trot classes because her canter is still extremely unpolished, but i was still nervous, and sort of embarrassed, by our performance in the Friday night warm-up show. She was flighty, looking around with her head in the air, stopping and trying to leave every time i went by the gate. Definitely not a horse broke enough to show. Saturday was a little better, a little more consistent, but i was still wondering why i was doing this. 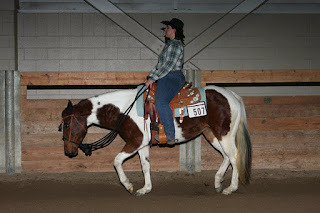 I had fun, don't get me wrong, but I was questioning why I didn't ride my broke show horse instead (my blogger friend over at mx-paints did get a couple cute pictures though). But by Sunday, the whole showing concept clicked for Molly, and she was a totally different horse. Head down, consistent and slow, relaxed, totally listening to me - and it resulted in a second place out of 22 horses! I was pretty happy with how quickly she figured it out, and i have renewed hope that i just might have two broke show horses by the end of the summer. Our next show will be the end of February, and the goal is to be loping well enough to compete in the 1st year loper division. Our pleasure class on Sunday, photo taken by Just Plain Crazy Ranch.